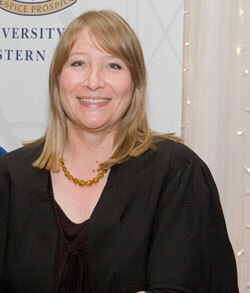 Leslie Petrik is a professor in the Department of Chemistry University of the Western Cape (UWC), and group leader of the Environmental and Nano Science (ENS) group. She does academic teaching and research. What was your career path to your present position? I obtained my PhD in 2008 at UWC, after working in industry and at universities for many years before I qualified. Our research is in nanoscience, and environmental remediation with a focus on development of nano phase materials and catalysts. This includes the synthesis, modification, characterization and application of nanostructured heterogeneous catalysts, photocatalysts and electrocatalysts as well as high capacity adsorbents. Moreover the research investigates synthesis and application of micro and mesoporous materials from waste, including zeolites, nanostructured adsorbents, functional nanofibres and ion exchangers for brine treatment and toxic element removal from water. Composite photocatalysts and electrohydraulic discharge systems are also being developed for organics decomposition and disinfection of contaminated effluent water. What role does nanotechnology/nanoscience play in your research? The aim is to gain a deeper understanding of the design, fabrication and performance of nanostructures in order to engineer active nanometal alloys and structures. Our studies aim to provide valuable knowledge for the intelligent design and application of future materials. Describe any success or highlight you have had in your research so far. I received the UWC Vice Chancellor’s Annual Distinguished Researcher Award, in the Natural and Medical Sciences for 2012 awarded by UWC on 18th September 2013, acknowledging the leading researchers who bring honour to the University through their cutting-edge work. I was recognized as a Distinguished Women Scientist, in Physical and Engineering Sciences, Women in Science Awards, by Department of Science and Technology on 24 August 2012 in Centurion, Pretoria. These awards go to women scientists and researchers who have made an outstanding scientific contribution to advancing science and building the knowledge base in their respective disciplines. The criteria used for this category include consideration of the nominee’s teaching and research experience, research and innovation outputs, national and international eminence, and experience in supervision and mentorship aimed at achieving equity and redress. Messages for students wishing to enter this field. Nanoscience offers the opportunity to design and engineer functional materials at the nanoscale but these materials need integration up to the macroscale to become useful. Young scientists should not lose sight of the challenges that integration and scale up present. There are also many issues such as toxicity and ethical dilemmas that arise from the applications of nanomaterials which need to be resolved before such materials are released into the market place. Furthermore, scientists cannot solve every problem with a technical intervention and should be aware that their intervention is often not the most appropriate solution to a problem caused by societal ills.